Hwy 45 North, exit #54 / Hwy 167 E. (Lannon/Mequon Rd.) Right on Mequon Rd. Left at Maple Rd. Left on Fulton Dr. 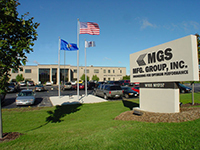 In business since 1982, MGS Mfg. Group is a leading global provider of vertically integrated optimized manufacturing solutions for high precision plastic products. Our services include: engineering & design-for-manufacture, mold making, sampling & development, injection molding, value-added contract manufacturing operations, multishot technologies, scalable automation and application-specific turnkey manufacturing systems.